St. Louis Pet News Is Your Dog Manipulating You? Dogs are an incredibly intelligent species. We know this – that’s why we train them to do so many impressive things! From the basic sit and roll over to the more complicated training that comes with an electric dog fence installation, dogs catch on quickly to any new task you throw at them. This is one of the many reasons we love them and proudly call them man’s best friend. But is there a chance this uncanny level of puppy-intelligence is being used against us? In other words: is Fido manipulating you? In short, yes. Dogs are intelligent and they care about other beings – like their people or other animals in their pack. But it’s also important to recognize that one of their primary drives is to get what they want. Think about it. When you train them, you usually use treats or praise as a reward – stuff that they want. They’re willing to learn new things to reach those goals or fulfill their needs. Following this logic, dogs would be willing to manipulate you (or their fellow furry friends) to get what they want. For example, have you ever seen a dog trick their buddy into giving up a bone? Maybe they run to the front door like the mailman is there, or they bark at a squirrel to distract their dog-friend – only to return to the original bone they were after once it’s available. If you think they’re capable of manipulating one another but not you, you’re likely being manipulated by them without even realizing it. Scientific studies have shown us that dogs recognize and understand both dog and human emotions. They can evaluate your body language, expressions, tone, and more – and they use these visual cues to guide their behavior. That’s what makes training dogs so much easier than training some other breeds of household pets. It also is what makes them seem more relatable, or friendly. So, if we know that dogs are driven by achieving their goals or fulfilling a want or need, and that they are excellent at ready human emotions and cues then, yes, they are likely manipulating us to get what they want. How does this manipulation play out? 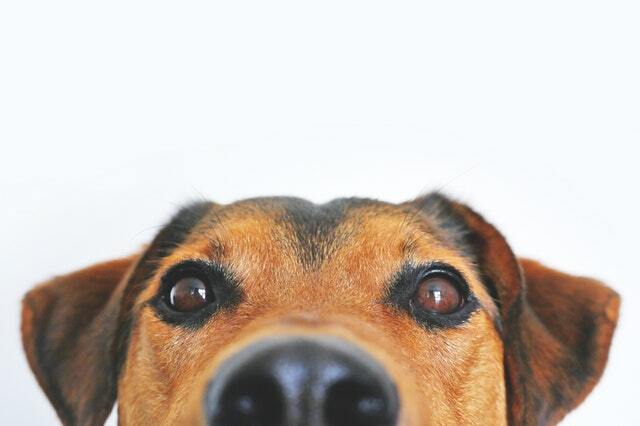 There’s no need to worry – your dog’s manipulation of you isn’t necessarily a bad thing. Some manipulations are necessary for you two to coexist in the same house. For example, if a dog waits by the back door to be let outside – you know they need to go to the restroom. So, you let them out. However, maybe they just want to play outside. Regardless, they know that your response to them waiting by the back door is that they get to go be in their yard. See? Not such a big deal. However, in some situations, you need to be aware that your dog’s manipulation can cross some boundaries. It’s important to remember that you are the leader of the household – not Fido. Every dog will push the boundaries occasionally. They’ll give a few extra puppy-dog-eye glances if they want extra attention. Or maybe they wake you up way too early for your morning walk because they’re just dying to go investigate the rabbit they saw outside the window. It only becomes a problem once your dog is regularly pushing boundaries and using manipulation to try and get what they want – even when it’s not what’s best for them or you. How do you control the “bad” manipulation? To avoid your dog becoming a power-hungry pup who manipulates you and others left and right, just remember to evaluate them and their actions. Taking a step back to see whether they need something or whether they just want it is important. If they’re barking at the back door to be let out – they may need to go outside. If they just went for a potty break and its icy cold outside during the winter and they’re still barking at the back door – they may not need to go outside. They want something that’s bad for them. Dogs are smart – but not as smart as we are. They may want the entire pan of brownies, but they shouldn’t have it. They’re demanding something that they don’t need, and it’s an inconvenience. If your dog is pawing at you for attention while you’re in the middle of something, it’s okay to ignore them. If their need isn’t pressing, you get to decide whether they get treats or attention. Yes, dogs can be manipulative. But they’re still our favorite furry friends. In fact, most of the time their people-reading skills are great – like when they come greet you at the door after work because they know it makes you (and them) happy!